Home » Information » Dust and Vulcanic Sand Very Profitable. Sand contained in volcanic materials spewed volcanic, including Mount Merapi, is best quality sand for building materials. The volcanic ash is best used to restore soil fertility. Volcanology lecturer who is also Head of the Center for Disaster Management Studies University of National Development Veteran Yogyakarta, Eko Teguh Paripurno, when contacted from Jakarta on Sunday (11/07/2010) says, the function of volcanic sand is actually the same as ordinary sand. However, the content of silica (SiO) to create a high quality is very good. Sand volcano better used for water purification. The pattern of silica sand spired to make the ability to absorb the unwanted particles far better than ordinary sand. However, the use of volcanic sand as water purification equipment require other materials, such as zeolite and charcoal wood. "In water purification, function volcanic sand just replace the function of ordinary sand," he said. Volcanic sand is also very good for concrete materials. The tip of the pointed shape of silica particles that have a corner. The pattern of angular particles that make bonding with cement sand volcanoes become more powerful. Ordinary sand has rounded ends so that the strength of ties with other concrete-making material is weaker. Geothermal Lecturer and Gunung Api Bandung Institute of Technology, Asnawir Nasution, said that, in addition to silica, sand volcanoes also contain iron (FeO). Iron content of volcanic sand is very good because it has not experienced weathering, so good for building material mixture. "Sand volcanoes also contain very little clay. In addition to making concrete stronger, at least clay will also enhance the durability of concrete and making concrete kekeroposan lower level," he said. In Central Java, Mount Merapi to be the target sand, while in West Java, Mount Galunggung sand to be excellent. According Asnawir, Mount Galunggung sand prices could reach Rp 900,000 per truck, while the usual sand brought from Garut only priced at Rp 500,000 per truck. Eko said that volcanic material that can be utilized for only building in the form of sand or gravel. Large-sized material that only exists in some volcanic eruptions. If you look at the current eruption of Mount Merapi, the sand that can be used predicted only within a radius of 15 kilometers from the summit of Mount Merapi. Dust material can only be used to enrich the nutrients in the soil. Nutrient content of volcanic material can be used to neutralize the "exhaustion" of land that had been given plenty of inorganic fertilizer. According Asnawir, volcanic dust functions as a fertilizer is very much determined by the thickness and location. Thick volcanic ash that can not be used directly because it is still hot and high gas content. In the case of Mount Galunggung, mountain environments are destroyed by dust only takes one year to turn green again. 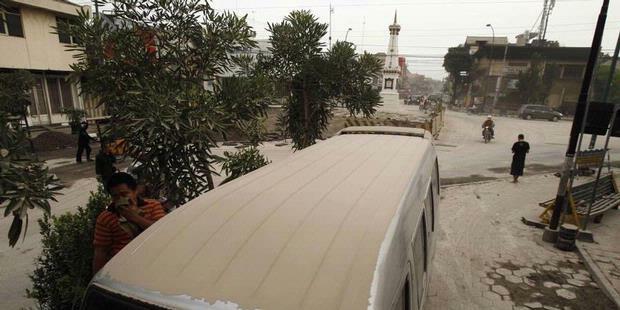 "The dust that reaches remote areas, such as dust Merapi in Bandung, remains difficult to utilize. Dust that thin will be easily carried by rain and wind making it difficult to use," he said. According to Eko, the eruption of Mount Kelud cases, communities surrounding the mountain has two long broom that can be used to clean sand and volcanic dust in their homes. The first broom dipped in water to wet sand enabled so you can easily pulled down. The second is equipped with a broom the dust used to draw moist material that is above the tile. Materials above the tile should not doused with water because it will increase the weight of materials remaining volcano. Because the load increases, the condition can lead to collapse of houses. "Techniques moisten the material on tile and use a long broom can be applied in the case of Merapi," he said.